These fish are silvery and frequently have irregular dusky longitudinal lines along its body. They have a slightly projecting lower jaw and small teeth. White perch spawn from April through June in fresh to low-salinity waters of large rivers over fine gravel or sand. Males are usually mature by age 2 and females, by age 3. Females produce from 50,000 - 150,000 eggs and do not release them all at once; ovulation may occur over a period of 10-21 days. Individual females are surrounded by several males and eggs and sperm are spread randomly. Eggs are generally demersal and attached in still water, but are pelagic in free-flowing streams and tidal waters. Eggs usually hatch from 1 to 6 days after fertilization. Juveniles use inshore areas of estuaries and creeks downstream of their spawning area during the first summer and fall. Adults tend to inhabit open waters close to shore, but may also frequent quiet streams well up into the tributaries from March - November. During the winter months, they can be found in downstream portions of the tributaries and deeper channel areas throughout the Bay. White perch are an important recreational species, especially in the upper Chesapeake Bay and its tidal tributaries. White perch are considered a delectable game fish. White perch are taken in nearly all types of fishing gear typically used on the Bay. White perch are available to anglers from shore and from boats because they are widely distributed among a variety of habitats, including inshore waters. Catches are greatest during the spring spawning season and from September through November. They are one of the most abundant fish in Chesapeake Bay and will spend their entire lives here. White perch are closely related to striped bass. The largest white perch caught in Maryland's portion of Chesapeake Bay weighed 2.6 pounds. 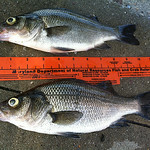 ​For information concerning white perch and their management, please contact Paul Piavis or Charlie Gougeon at 410-442-2080.